Our clients can avail from us a quality range of Industrial Crushers that is known for its high performance, smooth operation and low maintenance. These are widely used across the industry for various purposes. The range is available in standard & customized shapes and dimensions at industry leading prices. Our organization designs and manufactures a quality range of Roller Crusher that is used as secondary or tertiary crusher for smaller fraction. The range is fabricated using superior quality raw material and is reckoned for its higher capacity with less fines generation, uniform cubical output product size, smooth operation and low maintenance. Note: The Specifications and Images noted above are subject to change and can be used as guidance only. We manufacture a superior quality Biomass Crusher recovery system that is available in standard and customized sizes. These are simple to operate and are meant for crushing & shredding of agricultural waste, wood chips, corn & maize stems, wood barks, cotton stalks, coconut stems, ply wood waste, pulp. The range is acclaimed for its automatic operation, low maintenance and ability to chip & crush uniform cubical output particle size. 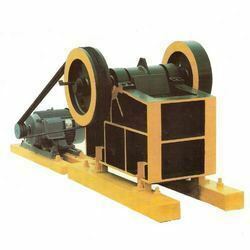 Hammer Crusher manufactured by us in compliance with the various industry requirements and is offered at economical prices to the clients. These Hammer Crushers are designed for crushing hard and abrasive material. The wear material used includes special alloy steels that are instrumental in preventing wear & tear of the crusher. Our range of Lump Breakers are equipped with Single or double rotor shafts fitted with series of evenly spaced breaker bars and fixed combs on the stator side. Reduces pieces or lumps from 200mm to 3mm sizes. Heavy and sturdy rotor design. Effective in reducing compacted material. 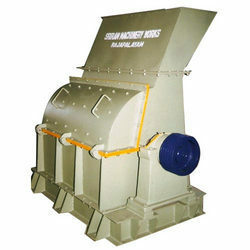 SRIRAM JAW CRUSHERS are designed for primary crushing of various Hard and Abrasive minerals with minimum rubbing action. There is no action of rubbing but by compression which produces a generally cubical product with minimum fines. 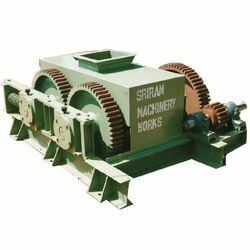 SRIRAM JAW CRUSHERS are Single Toggle Type having the Swing Jaw mounted directly on the Eccentric shaft so that it receives downward as well as a forward motion. The lower end of the Swing Jaw is held in position against the Toggle by a spring hold Tension rod. The setting of a Jaw Crusher may be stated as being the close or wide opening between the moving Jaw at the outlet end. The reciprocating motion of Jaws causes the opening to vary between Close and Wide, thus crushing takes place in that motion . Longer Durability, Reliability & Maintenance free system.